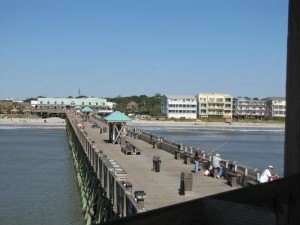 Did you know that the Edwin S. Taylor Fishing Pier on Folly Beach stretches 1,045 feet into the ocean? It does. That makes it the second longest pier on the East Coast at 25-feet wide and 23-feet above sea level. But the constant pounding of the Atlantics waves can take their toll. And the 17-year-old pier is currently undergoing a maintenance project that will span until the middle of next February. The project, which began in November, is addressing the pier and the diamond-shaped deck at the ocean-facing end. This means that some portions of the pier will be closed until the work is complete. But most of the walkway will remain open and can still be used for walking and fishing throughout construction. Regular winter operating hours8 a.m. through 5 p.m.will be used. Contractors Dock and Marine have been working since the end of November to replace metal hardware and repair the support piles that attach to the piers walking deck. Support piles that need repair will be wrapped and then filled with a grout-like material in order to improve the piers structural system. The projects anticipated completion date is February 14, 2013. For updates on the piers progress, visit ccprc.com.